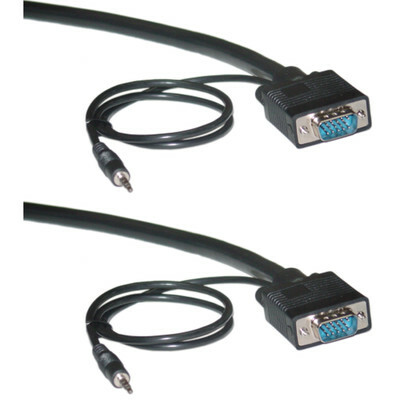 Our 15 foot black HD15 video cable with a 3.5mm Stereo Audio cable built in, more commonly referred to as a SVGA male to male cable with audio, is typically used to connect a computer to a computer monitor. Our SVGA video cables can handle the lowest resolutions used on computer monitors today all the way up to a maximum of 2048 x 1536. Plus this cable is double shielded to extend your video and audio signals without distortion or signal loss. The length of the audio cable is actually the length shown on the specification sheet. It is long enough to reach an audio port on the opposite side of the laptop from the video port! The product is just as described. Very good quality. Great product. Connected with ease. So far so good!! Bought for my stepson who kept borrowing a short cable off another computer. This met his needs and had a built in sound cable. No more missing vga cable. These work fine. We've never had a problem with any CW VGA cable.